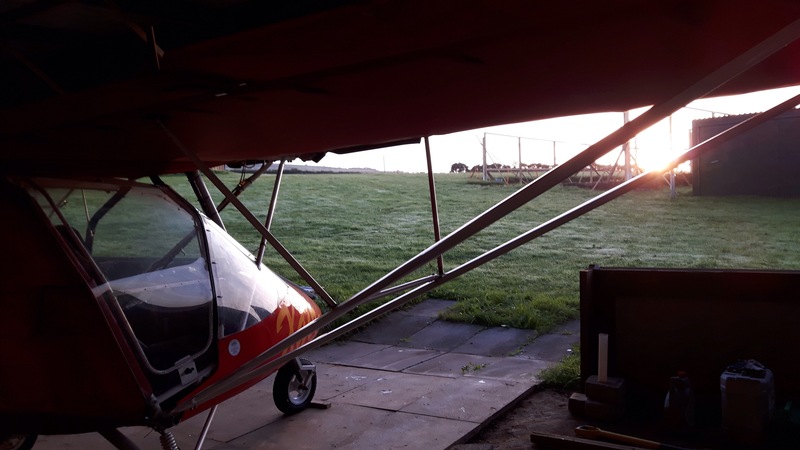 It’s been a rubbish summer, wet and windy and littered with tech issues – coolant sprayed over the whole flipping aircraft then a power check interupted by a whopping great mag drop but at the moment everything was running smoothly again. The window between sunrise and needing to leave the field for work was shortening though and seemed worth grabbing. I checked the weather. Temp and dewpoint would be close and the wind was flat calm. We decided that sitting cursing at mist would be, at the worst, a change of pace from sitting cursing at the windsock so arranged to head out for 6:30. I watched his updates as he headed from his house to mine – “clear here”, “mist in Neath”. I looked out the window, still clear. 50:50 chance then at least! We saw no more mist on the way to the field and the smoke plumes from Baglan and the steelworks rose vertical and undisturbed. 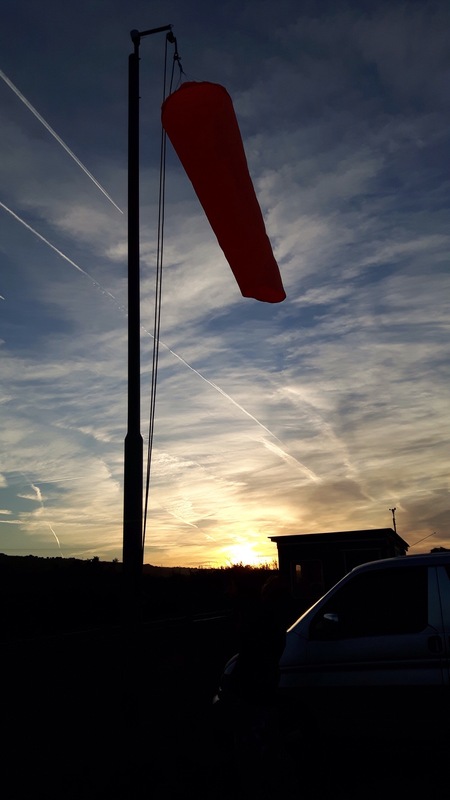 At the strip I jumped out and raised the windsock which dangled with barely a flutter. We peeled off to open up hangars and quickly shared a jerrycan of twostroke mix between the two aircraft. Steve flies a Shadow and during the weeks of tech difficulty, his machine and mine appeared to be taking it in turns to be the unservicable one. Steve was also temporarily non-radio. With this in mind, and being at opposite corners of the field I suggested we meet at the hold and give a thumbs up to indicate readiness so no one got left behind! Just as well, because the Shadow took its turn with the tech bug and failed to start. Lacking time to troubleshoot, we quickly dumped the gear out of my passenger seat and Steve hopped in there instead. I called on SafetyCom but there was no one else in the sky as we accelerated down the dewy runway and up. A thumb against the stick was all I needed for the climbout towards the beach, the air was so still. 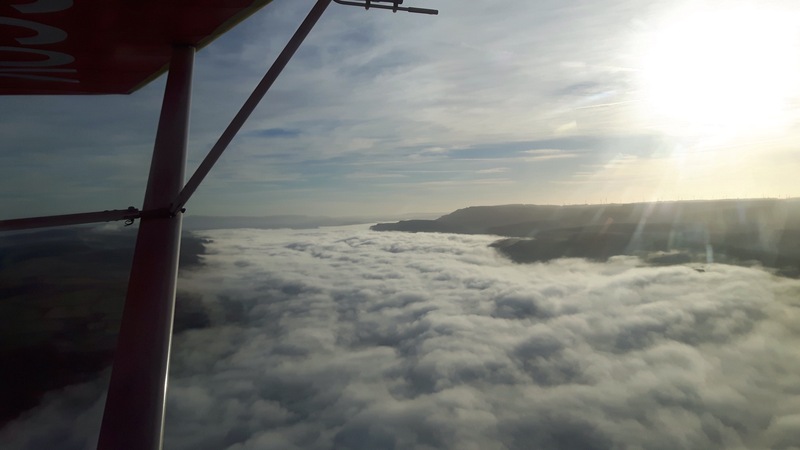 I tracked along the coast towards the inlet of the Neath river which we could see as soon as we were airborne had a second river – of mist – overlying it. It was one of those mornings you can’t quite believe are real, so calm and soft and still and with the low, early morning light silvering everything from the beach, to the damp fields, to the way the mist covered every watercourse. We flew mostly in silence, punctuated by exclamations about the view over a landscape which both of us had seen from the air any number of times before. This reverie was briefly injected with a dose of adrenaline while, when turning to photograph it, Steve elbowed the throttle to close to idle, inducing from me one vehement expletive and a firm pitch down. Calm restored, we drifted on up the river, past Drummau mountain. Drummau is one of those Welsh ‘mountains’ which earns the name more by historical convention than epic proportions, though at 892′ it is striking and a walk I keep meaning to do. On the other side of Drummau Swansea was in and out of mist, with the Tawe river as blanketed as the Neath valley. The hills (mountains?) further up both valleys looked more like islands. We headed back along the hills north of the motorway, to look at the newly erected windfarm and solar plant. 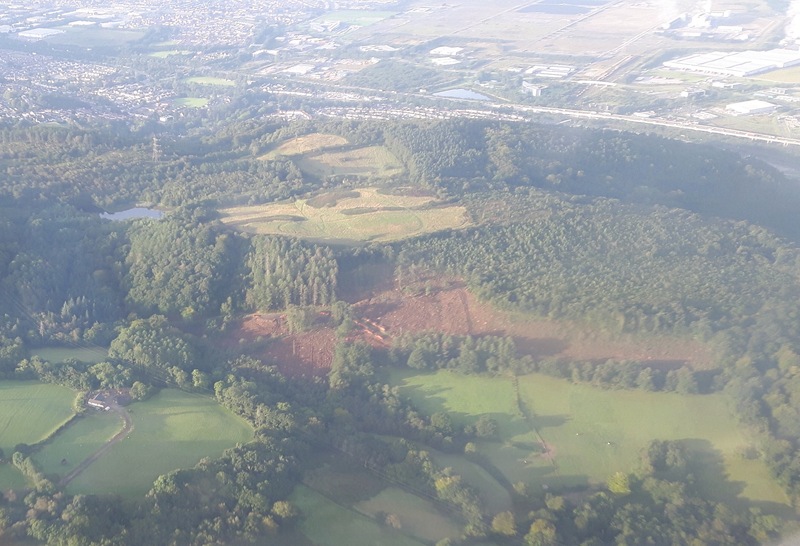 I detoured around the woods near my house to mounfully observe the huge swathe cut down to stop the spread of some nasty tree disease that had broken out. I circled about the solar farm for one more photo – the little X’Air turning on a wingtip. Steve was taking photos – it turning out that the “smile” I have when flying 50 degree banked turns at the same time look mildly deranged. Oh well. 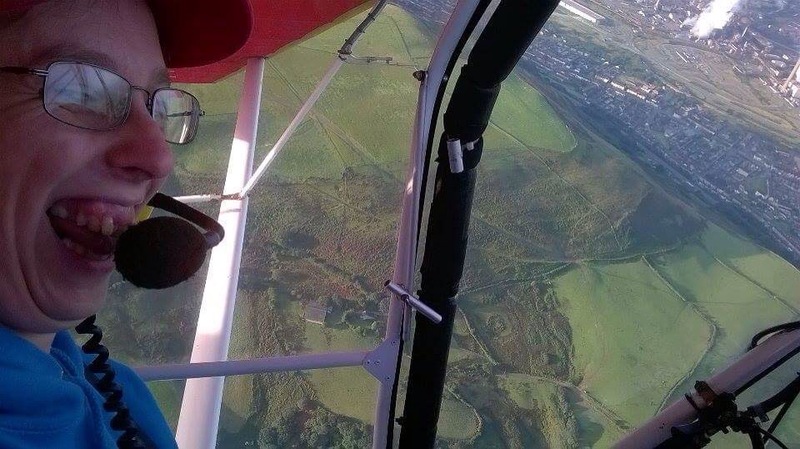 Back to the field over Nynydd Eglwys and in the absence of any wind to excuse me, and the presence of a pilot passenger, I attempted to made a tidy job of the landing. (Not too bad) Back down the hill to the hangar, slowly slowly with the brakes on the dew-wet grass. Then a scramble of putting away, closing hangar doors, wiping off of grass and the few early morning bugs. We both went to work with wet socks from the sodden grass, but what a lovely flight! 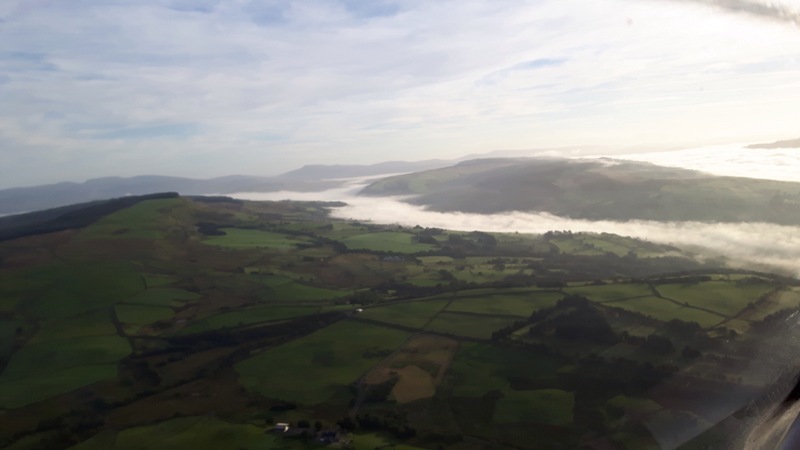 This entry was posted in Flights and tagged #MyKindOfFlying, #SkiesAboveBritain on 12 September, 2016 by Leia.